In this blog, we learn about the features of the 2015 Corvette ZO6 Convertible, such as it uses an electronic top that can be lowered by the car’s key fob. The all-new, 2015 Corvette Z06 will be one of the most capable convertibles on the market, offering at least 625 hp, 0-60 acceleration in under 3.5 seconds, true aerodynamic downforce, and available performance hardware including carbon-ceramic brakes and Michelin Pilot Sport Cup tires. 2015 Corvette Z06 Convertible Interior The Z06 benefits from interior details designed for high-performance driving, first introduced on the Stingray, including a steel-reinforced grab bar on the center console for the passenger and soft-touch materials on the edge of the console, where the driver naturally braces during high-load cornering. DETROIT – Chevrolet today introduced one of the most capable drop-tops on the market: the 2015 Corvette Z06 Convertible. With at least 625 horsepower, and 635 pound-feet of torque, the Z06 is also the most powerful convertible ever produced by Chevrolet. 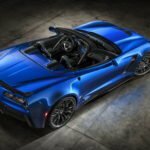 The Corvette Z06 Convertible represents the culmination of more than four years developing an all-new, all-aluminum structure for the seventh generation Corvette. 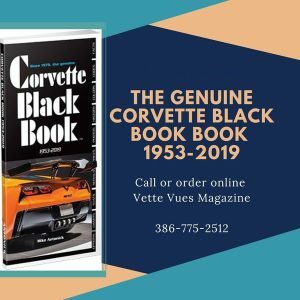 That structure, built at General Motors’ Bowling Green Assembly plant, was designed to the specifications of the Corvette Stingray, Corvette Z06 and the Corvette Racing C7.R. The team used nearly 186,000 computational hours of modeling to develop the frame. It features main rails composed of five customized aluminum segments, including aluminum extrusions at each end, a center main rail section and hollow-cast nodes at the suspension interface points. The gauge of each segment varies in thickness from 2mm to 11mm, tailored – along with the shape – to meet the strength and stiffness requirements for each frame section with minimal weight. * 37 feet of laser welds, which join frame sections via a precise beam of high energy that minimizes heat beyond the weld area for improved structural accuracy. The only structural differences between the Z06 Coupe and Convertible are provisions for mounting the power-folding top, and repositioned safety-belt mounts. Like the structure, only minor design changes distinguish the Z06 Coupe from the Convertible. The Z06 convertible features an electronic top that can be lowered remotely using the car’s key fob. The top can also open or close on the go, at speeds of up to 30 mph (50 km/h). With the top up, the Z06 Convertible is designed for a refined driving experience. A thick fabric top, offered in four colors along with sound-absorbing padding and a glass rear window, contributes to a quiet cabin and premium appearance. Behind the seat backs, dual accent panels – either Carbon Flash-painted or available with exposed carbon fiber – enhance the character lines of the tonneau cover. Corvette Stingray’s signature “waterfall” design originates in the valley between the nacelles, bringing the exterior color into the interior. The power-operated tonneau cover necessitated moving the air intakes for the differential and transmission coolers from the rear quarter panels on the Z06 Coupe to the underbody of the Z06 Convertible. Otherwise, both models share the same, performance-driven aesthetic. Both Z06 models are fitted with Michelin tires (Pilot Super Sport tires for the Z06; Sport Cup 2 tires with the Z07 package): P285/30ZR19 front, and 335/25ZR20 rear. * The Z07 package adds larger, 15.5 x 1.4-inch (394 x 36 mm) front and 15.3 x 1.3-inch (388 x 33 mm) carbon ceramic-matrix brake rotors for consistent performance lap after lap. They collectively save 23 pounds over the standard Z06 rotors. * The available Z07 package adds larger winglets to the front splitter, along with an adjustable, see-through center section on the rear spoiler enabling customers to tailor the aerodynamics to their preference. Compared to the Corvette Stingray, the Corvette Z06 fenders are 2.2 inches (56 mm) wider at the front, and 3.15 inches (80 mm) at the rear. Those extensions give the Corvette Z06 a wider, lower appearance further emphasized by a unique rear fascia. It incorporates the same taillamp assemblies as the Stingray, but on the Z06 the taillamps are pushed approximately three inches farther apart, toward to edges of the body. The exterior design also reflects the increased cooling required for the new Corvette Z06. For example, the mesh pattern on the front fascia was designed to deliver the most possible airflow to the supercharger’s intercooler heat exchanger, so much that the mesh grill directs more air into the engine bay than if the grille was removed. The unique grille also features dedicated brake-cooling intakes and wider grille outlets on the bottom serve as air diffusers. A larger hood vent allows air driven through the grille to exit through the hood rather than being forced under the car, which could create lift. 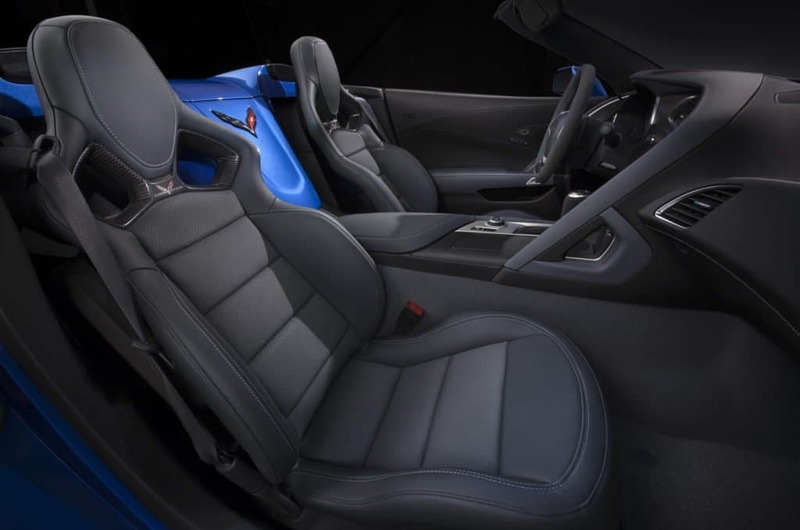 The Z06 benefits from interior details designed for high-performance driving, first introduced on the Stingray, including a steel-reinforced grab bar on the center console for the passenger and soft-touch materials on the edge of the console, where the driver naturally braces during high-load cornering. 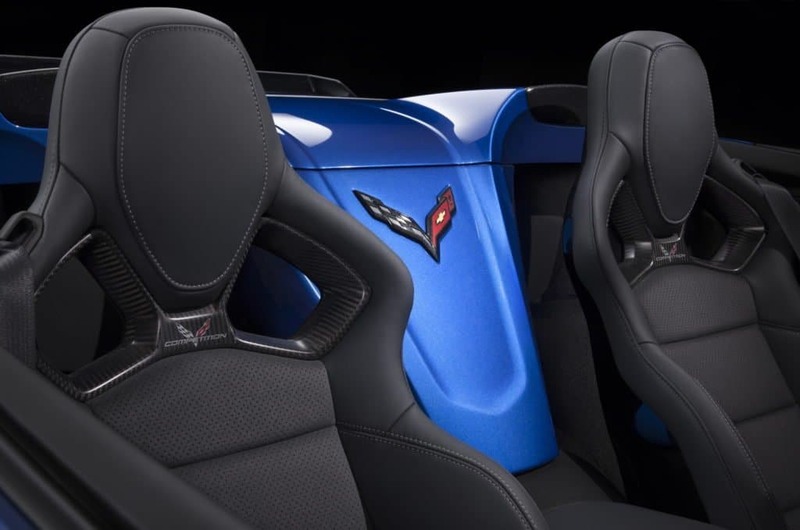 Like the Stingray, the Z06 comes with two seating choices: a GT seat, for all-around comfort, and a Competition Sport seat with more aggressive side bolstering, which provides greater support on the track. A magnesium frame structure for both seats provides greater rigidity and strength compared with steel frames. Unprecedented attention to detail and build quality complements the Corvette Z06’s performance. All models feature a fully wrapped interior, with every surface covered by premium, soft-touch materials. Available materials, depending on the trim level, include Napa leather, aluminum, carbon fiber and micro-suede. The interior also features a flat-bottom steering wheel with a carbon fiber center spoke. The Z06 comes in five interior colors, including two that are unique to Z06 – blue and dark gray. 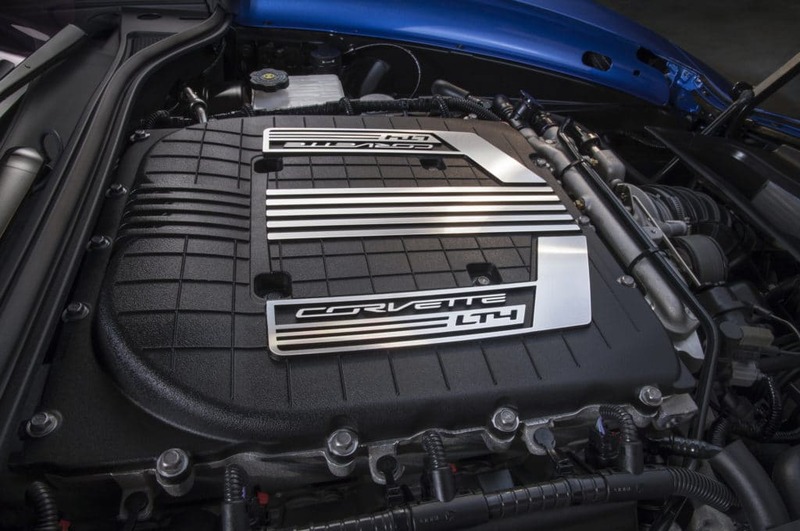 The heart of the 2015 Corvette Z06 is the all-new LT4 6.2L supercharged V-8 engine, expected to deliver at least 625 horsepower (466 kW) and 635 lb-ft of torque (861 Nm). To balance performance and efficiency, the LT4 leverages the same trio of advanced technologies introduced on the Corvette Stingray: Direct injection, Active Fuel Management, or cylinder deactivation, and continuously variable valve timing. The supercharged LT4 comes with a standard seven-speed manual transmission with Active Rev Match, or an all-new 8L90 eight-speed paddle-shift automatic transmission designed to enhance performance and efficiency. 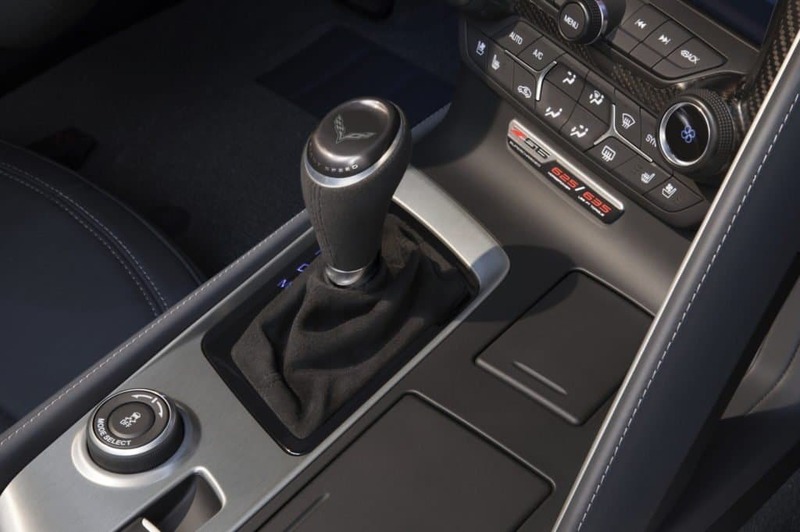 The seven-speed manual incorporates rev-matching technology for upshifts and downshifts. A new dual-mass flywheel and dual-disc clutch deliver greater shift quality and feel through lower inertia. The eight-speed automatic is tuned for world-class shift-response times. Smaller steps between gears keep the LT4 within the sweet spot of the rpm band, making the most of the output of the supercharged engine for exhilarating performance and greater efficiency. 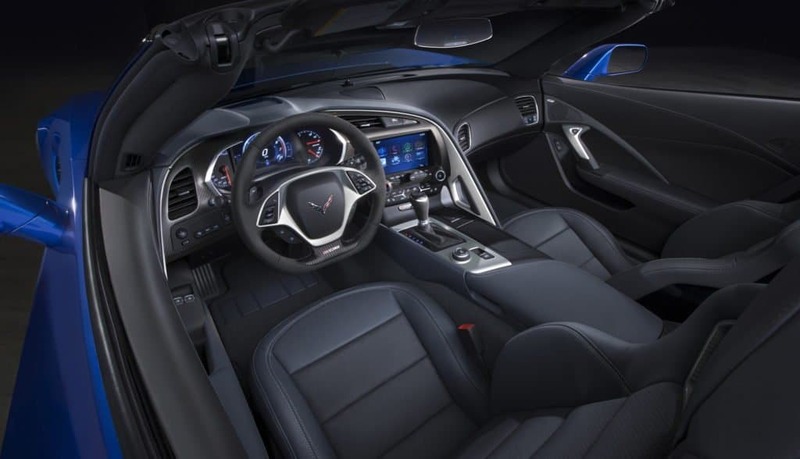 The 2015 Corvette Z06 Coupe and Convertible leverage the technologies introduced on the Corvette Stingray, with unique features and calibrations tailored for its capabilities. The new Z06 retains the SLA-type front and rear suspension design of the Corvette Stingray but uniquely calibrated for the higher performance threshold. The third-generation Magnetic Selective Ride Control dampers, adjustable for touring comfort or maximum track performance via the standard Driver Mode Selector, are standard on Z06. * Electronic Limited Slip Differential: Adjusts the rate at which the limited slip engages, balancing steering response and stability in different driving conditions with more aggressive performance in Sport and Track modes. The smart electronic limited-slip differential, or eLSD, is standard. 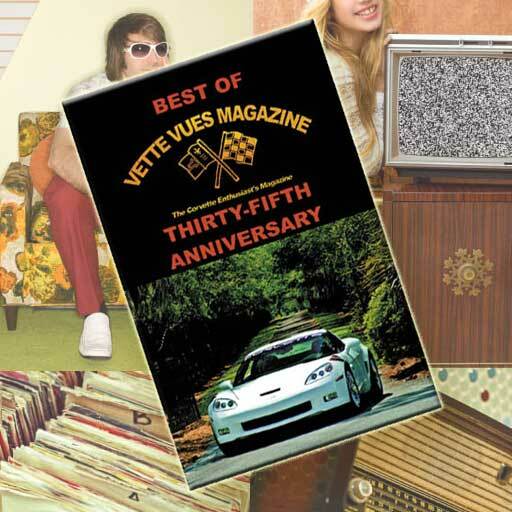 It features a hydraulically actuated clutch capable of infinitely varying clutch engagement. The system enhances all aspects of performance by constantly tailoring the clutch-pack engagement based on a unique algorithm that factors in vehicle speed, steering input and throttle position to improve steering feel, handling balance and traction. 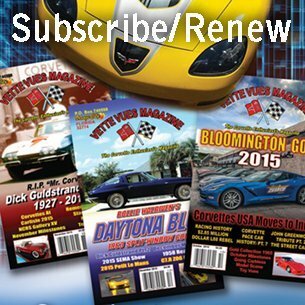 Tags: 2015 Corvette, 2016 Corvette ZO6	.